(August 24, 2011) One of China’s premier investigative news agencies reveals China’s dams “are like ticking time bombs”: beset by disaster, flaws, poor construction, neglect, and fraud. Chinese officials are beginning to admit to problems at the country’s showcase Three Gorges dam, but little has been said about the safety of Three Gorges and China’s 87,000 other dams. Now, a report from Southern Weekend (one of China’s premier investigative news agencies) reveals shocking details about dam collapses and other safety concerns presented to a meeting of the Chinese National Committee on Large Dams. Never before have such details of dams gone wrong been revealed to the public. Even Southern Weekend’s seasoned investigative journalists were taken aback to learn of the spillway tunnels that have been destroyed by flood waters, of flood discharge channels ripped apart as if by a bomb, and the collapse of one dam after only 13 hours in operation. Cracks have appeared in the shiplock of the Three Gorges dam — some 733 of them with a total length of 4,688 metres. Meanwhile, the Danjiangkou dam, which is slated to divert water to Beijing as a part of China’s South-North Water Diversion project also has cracks. In all, 3,481 dam collapse incidents have occurred in the 50 years from 1954 to 2003. Officials are now scrambling to shore up a host of poorly constructed and neglected dams, and to raise the standards for the very tall dams China is building in seismically active areas of the country. China has built over 87,000 hydro dams, more than any other country in the world. Hydro dams and reservoirs perform many functions including flood control, power generation, irrigation, and water supply and so forth, but the issue of dam safety has always been treated as a sensitive subject. Now, incidents at a number of dams and reservoirs have cast doubt on the quality of these projects, but they are rarely reported to the general public. A nation-wide survey focusing on key dams and reservoirs in China will be carried out, but the authorities have yet to disclose details. Given the recent debates about whether dams and reservoirs have caused droughts and floods, this idea is interesting and significant. The announcement that the survey will be carried out was made at the 2011 Annual Conference of the Chinese National Committee on Large Dams (CNCLD). Zhang Rushi, Deputy Director of the Work Safety Department of the Ministry of Water Resources made the announcement and stated that, through surveys and field investigations, the study aims to discover the true situation with China’s hydro dams. On June 18, 2011, about three hundred leading experts in China’s water resources and hydropower industry gathered in Yichang, Hubei Province, to attend the Annual Conference held by the CNCLD. The participants included Wang Shucheng, former Minister of Water Resources and current chairman of the CNCLD, and Lu Youmei, member of the Chinese Academy of Engineering and former general manager of the Three Gorges Corporation. During his presentation at the CNCLD meeting, Zhou Jianping, chief engineer of the China Hydropower Engineering Consulting Group, showed the audience about ten photos of different dam accidents. These images, never before disclosed, shocked the general audience, but especially reporters from the media. Afterwards, reporters from Southern Weekend did a great deal of research, but could find little detail about the incidents on the Internet. The first picture was about the Ertan Hydropower Station built on the Yalong River (a tributary of the Yangtze, in Sichuan Province), whose spillway tunnel was completely destroyed by flood waters. For the general, non-technical audience, like us, it was especially difficult to imagine how such a solid reinforced concrete structure could be washed away and broken into pieces like a heap of loose sand. As the speaker, Zhou Jianping said, it was very fortunate that they found the problem in time and fixed it, or the Ertan dam would have been seriously threatened. Another photo caused a buzz in the audience: the flood spillway of the Sanbanxi dam in Jinping County, in southeast Guizhou Province, was totally destroyed on July 26, 2007, after only 13 hours of operation. Apparently, there was a problem with the quality of construction, causing as much as 13,000 cubic meters of concrete and rock to wash away, leaving a pit as deep as 11 meters, or the equivalent of a three-story high building. According to Zhou Jianping, the consequences could have been disastrous if floods had occurred at the same time and the operators were unable to close the sluice gates. At the Jinghong dam, built on the Lancang-Mekong River and lauded as one of the most important hydro dams in Yunnan Province, the flood discharge channel twice suffered serious damage from floods, once in 2008 and then again in 2009. As the picture illustrated, the channel was torn open like a big mouth as if blown up by a bomb, with steel bars hanging around like withered plants. Another of the incidents resulted in casualties: as Zhou Jianping explained, the road leading to the site of the Jishixia dam on the Yellow River in Qinghai Province suddenly collapsed one evening as a result of silt being discharged. Drivers of two vehicles unknowingly drove along the damaged road, crashing into the Yellow River. At least eight people are still missing. In his speech to the conference, Zhou Jianping concluded that the accidents were the result of low standards, including inadequately prepared surveys, unscientific design and construction plans, mismanaged construction, absence of quality control and supervision, and even fraud in building materials. All of these factors have contributed to the poor quality of dam projects and compromised the safety of dams. Pan Jiazheng, one of the founders of China’s hydropower industry and an expert in water resources, often warned that any errors and oversights in dam design and construction would compromise the quality of the projects. Dealing with the aftermath of these problems would be more costly, he said, including the loss of innocent lives. For example, on August 27, 1993, the dyke in the Gouhou reservoir in Qinghai Province burst, killing 288 people (the dam’s height is 71 m). Back in August 1975, two large reservoirs, Banqiao and Shimantan, together with two other medium reservoirs and 58 small reservoirs in the Zhumadian area of Henan Province, collapsed one after another, in just a few hours. [i] Ten counties and towns in Zhumadian were flooded by as much as 5.7 billion cubic meters of water, and 26,000 people died as a result. Dams under construction are also encountering problems. The Xiluodu hydropower station, for instance, China’s second largest hydropower dam on the Jinsha River, has been experiencing construction problems going back to 2010. Engineers and workers on the construction site found that, after pouring hundreds of cubic meters of concrete, the template was incorrectly positioned. A person familiar with the situation said that the financial cost of the mistake was not big, but the time lost to removing the concrete (which had already solidified), and re-pouring it, seriously affected the project’s schedule. As the Chinese media put it ironically, China’s hydropower construction has entered a “Great Leap Forward,” with the giant power companies divvying up watersheds and rushing to construct hydropower projects. According to recent news, the Three Gorges Group is accelerating its construction of four giant hydro dams on the Jinsha River that will generate twice the power output of Three Gorges if all the projects go into operation. This situation worries the older generation of hydropower experts. As Wang Shucheng explained, it used to take years to prepare surveys and investigations before construction of a dam began. Now the job is usually done in a hurry, he added. Especially worrying, many large projects are being built in southwest China where the geological conditions are complicated and the area is seismically active. For that reason, it will be particularly dangerous to build dams without a sound plan and without implementing it stringently, Mr. Wang warned. According to information provided by CNCLD, as of 2009, China had built and was constructing 5,443 hydro dams with a height greater than 30 meters. Thirteen of those are higher than 200 meters. But the “Dam Safety Regulations,” which are meant to govern dam construction in China, were issued in 1991 and apply only to dams up to a maximum height of 200 meters. “The problem is that the regulations lag behind the reality,” Zhang Rushi, Deputy Director of the Work Safety Department of the Ministry of Water Resources told the 2011 CNCLD conference. Because the regulations are inadequate when it comes to meeting current needs for dam safety, it is a high priority that they be revised. China’s poorly constructed dams and those that have become dangerous after years of neglect are like ticking time bombs. 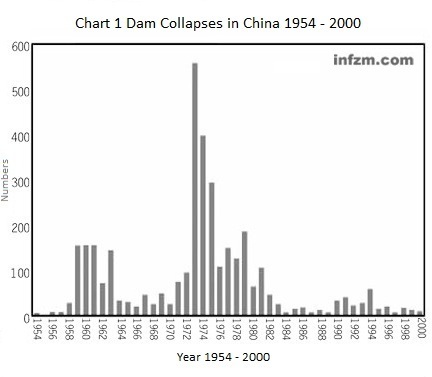 According to an earlier report about dam incidents entitled “Statistics and Preliminary Analysis of Incidents with Dams and Reservoirs in China,” more than half of China’s reservoirs were built between 1950 and 1980, most under conditions known as “building while investigating, and building while designing.” These circumstances led to low standards and poor quality construction. To make matters worse, most are today in a dangerous state of ill-repair after decades of operation (see charts below). Note: The data in Chart 2 comes from statistics gathered between 1954 and 2003. Dams in Chongqing Municipality are included in Sichuan Province’s statistics because Chongqing Municipality did not exist at the time, but came under the jurisdiction of Sichuan Province. 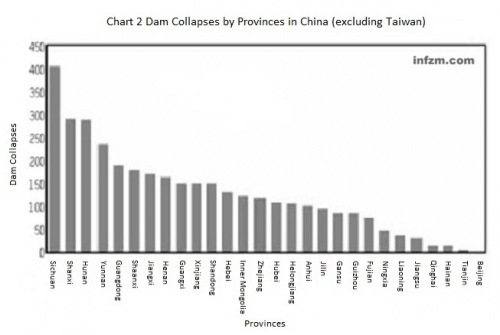 Source: “Statistics and Preliminary Analysis of Incidents with Dams and Reservoirs in China,” by He Xiaoyan, Wang Zhaoyin and Huang Jinchi, and Ding Liuqian. (Charts by Li Bogen). China has become increasingly concerned about dam safety and has repaired and reinforced 9,225 poorly constructed and dangerous reservoirs in the past ten years. In the last three years alone, 64.5 billion yuan RMB has been spent. In the next five years, 41,000 reservoirs are set to be repaired, requiring large financial commitments from state budgets. As Zhang Rushi said, the preparatory work for the nationwide survey of big dams and reservoirs has already been done. The investigation will now be carried out by the Ministry of Water Resources, together with the State Administration of Work Safety, the State Electricity Regulatory Commission, and the Ministry of Agriculture. Ministry of Water Resources, together with the State Administration of Work Safety, the State Electricity Regulatory Commission, and the Ministry of Agriculture. Click here to read the original article published in the Southern Weekend. Return to text: These dams collapsed as a result of a typhoon. See “The World’s Most Catastrophic Dam Failures,” by Yi Si in The River Dragon Has Come!, by Dai Qing, Probe International, M.E. Sharpe, 1998. Also see “Dams are worse,” by Lawrence Solomon, Financial Post, April 1, 2011. Return to text: The Danjiangkou dam is the middle source of water in the South-North Water Diversion project. Return to text: Chongqing Municipality was created in 1997, encompassing the original city of Chongqing and large areas that were formerly part of Sichuan Province. So, this incident must have occurred before 1997. Pingback: Will the Oroville Dam survive the ARkStorm? | Climate Etc.